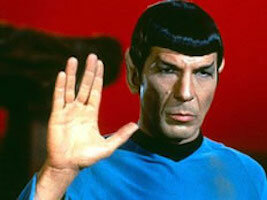 What's the origin of the phrase 'Live long and prosper'? 'Live long and prosper' is an abbreviated version of a traditional Jewish religious blessing. It came to a wider public in the Star Trek TV series, where it was used there by the character Mr. Spock (actor Leonard Nimoy, himself Jewish) as the greeting of the Vulcan people. The phrase was the spoken greeting/blessing that accompanied the hand gesture called the Vulcan salute. 'Live long and prosper' is translated, if that is the correct word, from the Vulcan language phrase 'dif-tor heh smusma', which was so uttered in Star Trek: The Motion Picture. The phrase echoes the Hebrew 'Shalom aleichem' and the Arabic 'Salaam alaykum', which roughly translate as 'peace be upon you'.